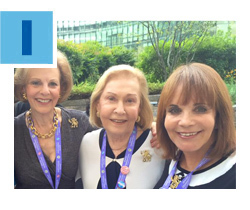 Thirty-six women representing the Greater Miami Jewish Federation joined 1,300 others from around the world to celebrate the power of women’s philanthropy at the International Lion of Judah Conference, September 11-13 in Washington, D.C. At the conference, convened by The Jewish Federations of North America, attendees heard from a variety of respected speakers, including former U.S. Secretary of State Madeleine Albright. A highlight of the event was the presentation of the Kipnis-Wilson/Friedland Award to long-time Lion of Judah Helene Berger. Read more. 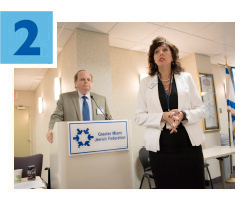 Last week, 120 people, representing more than two dozen organizations, discussed security best practices at the Community Security Conference and Workshop, presented by the Greater Miami Jewish Federation’s Office of Community Security and the Anti-Defamation League. A total of 14 law enforcement agencies were present, including local police departments, the FBI, the Florida Department of Law Enforcement, the U.S. Department of Homeland Security and the Department of Justice. Spearheaded by Barry Gurland, Federation’s Community Security Committee Chairperson, and Brenda Moxley, Federation’s Community Security Director, the day included presentations, a question-and-answer panel led by law enforcement command staff, a seminar discussing lessons learned from the Sandy Hook school shooting and much more. Continue reading here. 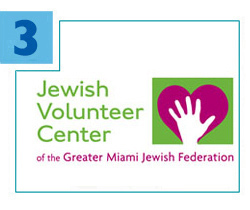 Federation’s Jewish Volunteer Center (JVC) is taking its popular volunteer programming one step further with its Miami Service Challenge, which encourages local groups to participate in rewarding service projects. Thanks to generous funding from Blue Cross and Blue Shield of Florida, tax-exempt nonprofits can apply for a grant to implement one of 10 turn-key JVC projects that serve homeless people, hungry families, lonely older adults and other vulnerable populations. Selected organizations receive instructions, supplies and other guidance from JVC to ensure each project's success. For information, contact Lori Tabachnikoff at ltabachnikoff@gmjf.org. Read more. Federation, through our overseas partner, The Jewish Agency for Israel, recently helped 200 new immigrants move from Ukraine and Germany to Israel. In 2015, Ukraine was the second-largest source of aliyah, with 7,000 olim (new immigrants) moving to Israel, compared to 2,000 just two years prior. 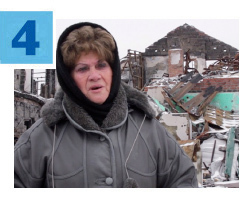 Many Ukrainian Jews have abandoned their homes in the embattled eastern areas of the country and have looked to The Jewish Agency for support in relocating to the Jewish homeland. The number of olim arriving from Germany has also seen a significant increase, rising 50 percent last year. Read more. 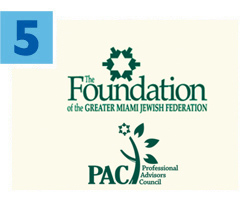 Don’t miss The Foundation’s Professional Advisors Council (PAC) Fall Seminar on Combating BDS: Changing the Conversation and Investing in Israel, taking place Wednesday, September 21. As the campaign to boycott, divest and sanction (BDS) Israel continues, it’s critical to educate yourself on the challenges facing the country. Join moderator Steve Wagner and investment advisors and business leaders Brian Friedman, Brian Rosenzweig and Steven Schoenfeld in an informative dialogue at Temple Israel. The program begins with lunch at noon, followed by a panel discussion on how you can support Israel and fight BDS. Click here for details and to RSVP. For more information, contact Emily Stone at estone@gmjf.org or 786.866.8414.